I love good ghost stories. Last year about this time, I was reading a masterful collection of M.R. James’s stories, and I’ve loved ghost stories old and new by Neil Gaiman, Elizabeth Hand, Henry James, Edith Wharton, H.P. Lovecraft, John Crowley, and dozens of others. So when I discovered that E.F. Benson was as well-known for ghost stories as for his popular Mapp and Lucia books, I had to nab a copy of this anthology. There are more than fifty stories in this book. If you’ve been reading here a long time, you may dimly recall that my usual procedure is to read an anthology straight through, as if it were a novel. There are pros and cons to this approach: on the positive side, I actually get finished with the book sooner rather than later, rather than letting it linger, and I get a real sense for authorial voice and themes; on the possibly negative side, I read over six hundred pages of excellent E.F. Benson ghost stories in a row and may be done with them now. These stories really were good. Benson’s ghosts are more varied than M.R. James’s or even Lovecraft’s. Most often, they are terrible apparitions, the ghost of a murdered person or a contrite murderer. But there are vampires here, too, as well as psychic visions, the great god Pan, horrible flesh-eating centipedes, and a few visitations from minor gods. Where James’s ghosts gibber and lump along, covered in hair or crumpled cloth in the semblance of a face, Benson’s ghosts remind us of our worst selves and those we know best: they limp, they whistle, they grin with vacuous glee. I am really an expert at ghost stories, and I still got the horrified shivers at more than a few of these stories. Reading them all together gave me a chance to see some of the themes, the way the stories are linked. Benson himself never married, and it’s presumed from some of his behavior (living with a friend on the notorious isle of Capri, for instance) that he was a quietly closeted homosexual. Women don’t fare well in his stories. Either they are nonentities, anonymous wives and mothers, or they are horrifying, threatening workers of evil. There is a particular type of woman in his stories — the large, handsome, rosy-cheeked, knowing woman — who is inevitably sadistic and vile. It made me kind of wonder whom he knew who fit this bill. But it’s not usually men who are the beloved in these stories, it’s houses. One house after another is described in the most glowing terms. In one of the most charming and tender ghost stories I’ve ever read, “Pirates,” a man who is the last surviving member of his family buys his old, dilapidated childhood home and sets about restoring it, as his lost and beloved brothers and sisters come to populate its rooms. In “Bagnell Terrace,” a man who covets his neighbor’s perfect home gets his comeuppance; this theme is reprised in “Home Sweet Home” and “The Corner-House.” Even in stories that have nothing to do with the house itself, you’ll find tender descriptions of rooms, gardens, hallways, furniture. One very interesting thing about these stories is the fairly frequent mention I found of religion. Benson was the fifth child of an Archbishop of Canterbury and must have been steeped in Anglican tradition. It’s not at all uncommon for a narrator of one of his stories to be in absolutely dire straits, face to face with ultimate evil, and to gasp out a prayer. In “The Temple,” in which a pair of healthy men find themselves in thrall to a sacrifice-stone laid in the floor of their house (houses again! ), the narrator barely rescues himself and his friend by calling on the Almighty. And in “The Hanging of Alfred Wadham,” a priest is told under the seal of confession that a man who is going to be hanged is innocent, and must watch him die. Naturally, he is haunted afterward — but by what? These religious overtones simply don’t exist in James and Lovecraft. Finally, for those of you who love the Mapp and Lucia books (and if you don’t, you should), there are some extremely light, witty stories that could have been taken straight from their pages. “Spinach” is such a story, with two delightful fraudulent mediums finally getting a real visitor from Beyond, and “The Psychical Mallards” is another. Benson can be gruesome, and frightening, and delicate, and tender, and also extremely funny. Such a versatile and prolific writer I’ve rarely encountered. You may not want to read all of these in a row, the way I did, but a few of them here and there are just enough to give you that delightfully creepy feeling you need as autumn begins to close in. Such great comments on how these stories compare, especially on houses and religion. I don’t think I ever realised that houses play such a pivotal role in ghost stories although it sounds very logical now that you mentioned it. Congrats on the BBAW win! I love your blog. Thank you so much! We are thrilled! I didn’t know Benson had written ghost stories–fun! 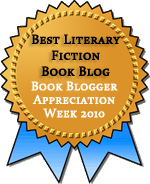 I just saw y’all had won Best Literary Fiction Blog for BBAW–congratulations times a million! Very very well deserved. Thank you so much, Other Jenny! And yes, I love finding out that someone I enjoy for one genre has written something completely different. Always enjoyable. How fun that he wrote ghost stories! This isn’t my favorite genre, but I’ve been enjoying the ones I’ve read by Henry and Edith. (And EFB did live in HJ’s house.) Speaking of which, did you ever read The Haunting of Lamb House? You might like it. I just found out about his living in Henry James’s house! That is so interesting. And later, Rumer Godden lived there, too. What a house! I didn’t realize Benson wrote ghost stories, but then, I don’t know much about Benson, except that I read the first Lucia book. I really enjoyed it, so I’m guessing I would like these too! I haven’t read many ghost stories in my life; perhaps I should. I love good ghost stories. M.R. James is probably the acknowledged master of the 19th-century genre, though there are lots of other good ones out there, now and then!